The Asterisk War Episode 24: Hydra Attack! Claudia’s Dad Did What? 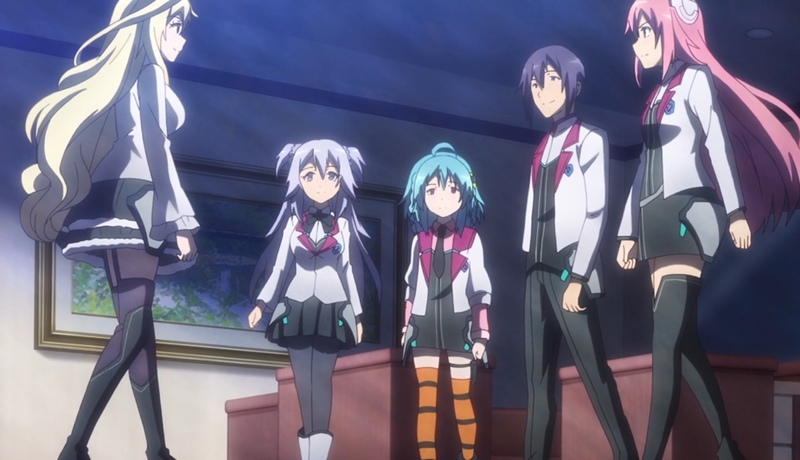 In Reunion, the the last episode of The Asterisk War’s second season, Julis Riessfeld, Amagiri Ayato, Sasamiya Saya, and Toudou Kirin face off against Gustave Malraux; Claudia Enfield takes care of a pressing family matter affecting them all; Jolbert Riessfeld makes a surprisingly kingly decision. To celebrate the last episode of the second season, check out this merchandise from Amazon! Shockingly, Julis wasn’t mad that Saya and Kirin kept Ayato company as he was unconscious. She even praised their dedication! Capture from the Crunchyroll stream. Ayato wakes up with Saya and Kirin sleeping beside him. Before he can react, Julis walks in to say he was unconscious for three days. 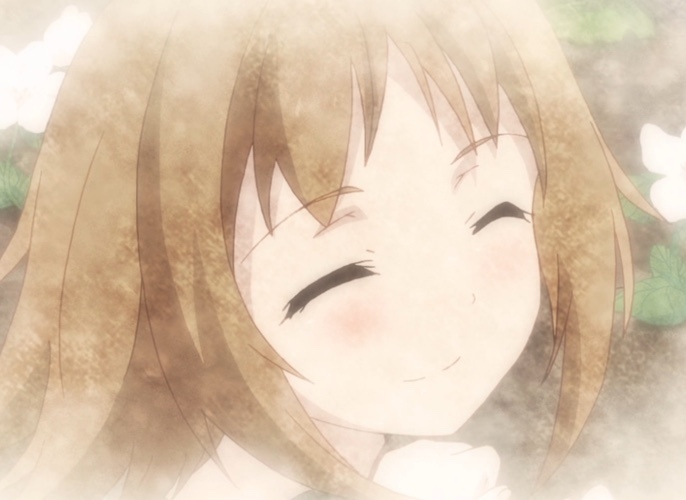 He seemed relieved when Julis praised Saya and Kirin for staying with him the whole time. She also thanks her for saving her from Orphelia. Julis explains that Orphelia had been her best friend before ungainly men took her away as collateral for the orphanage’s debt. They took Orphelia to an Integrated Enterprise Foundation laboratory run by Arlequint Academy’s student nicknamed Magnum Opus. They turned Orphelia into an artificial Genestella with staggering power. Unfortunately, she couldn’t control it, and she destroyed the lab. That’s the burned out building that Julis and Ayato saw at the end of the last episode. Julis says that she had to face Orphelia and defeat her, alone, because otherwise, Orphelia won’t listen. However, Julis goes on to say that their biggest problem right now is Gustave. As they’re making plans, Flora Klemm bursts into the room with terrible news: dragons are attacking the city! Immediately, they recognize Gustave’s tactics and begin formulating a response. Using the flame wings we saw in the Phoenix Festa, Julis, carrying Ayato, flies into the slums surrounding the orphanage. As expected, they find Gustave waiting for them. He summons a huge mythical Hydra from the lake and unleashes it against the slums. 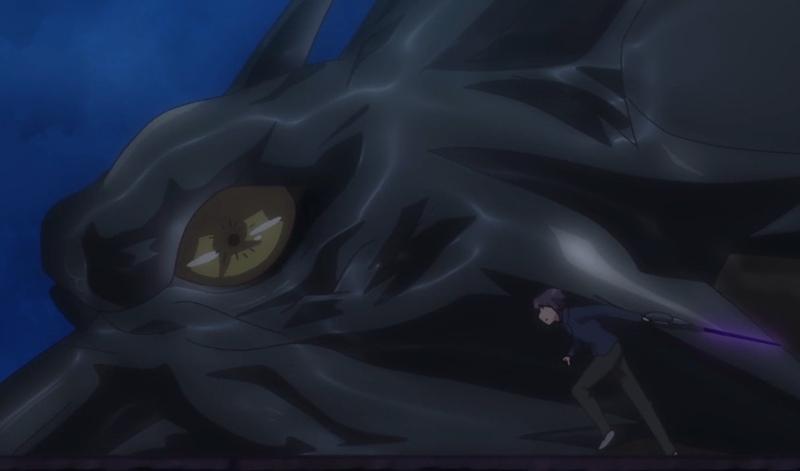 Ayato asks Julis to begin evacuation as he engages the Hydra. Where are Saya and Kirin? How will Ayato fare against the Hydra — and will Julis be able to evacuate the slums in time? Ayato awakens from a dream that replayed the critical events from the end of the last episode. He realizes that he must have passed out shortly after Claudia arrived and drove off Gustave. He’s comforted when he sees that Saya and Kirin have both fallen asleep beside him. 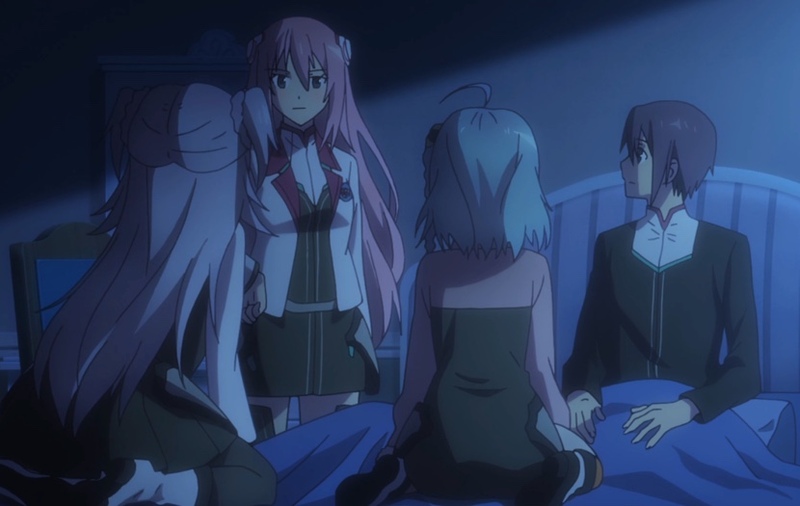 Julis comes in and tells him he’s been unconscious for three days; Saya and Kirin wouldn’t leave his side. 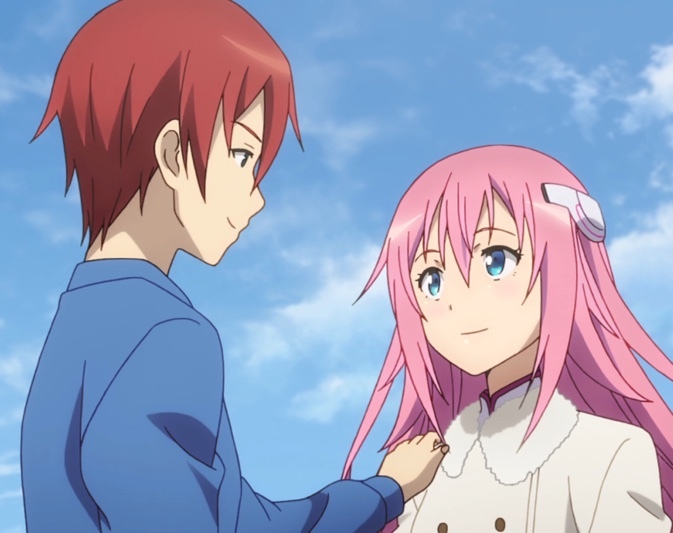 Julis thanks him for helping her survive the encounter with Orphelia Landlufen at the end of the last episode. While she lived at the orphanage, Orphelia wouldn’t harm an insect. Things changed after she was taken away. Shockingly, Julis wasn’t mad that Saya and Kirin kept Ayato company as he was unconscious. She even praised their dedication! Capture from the Crunchyroll stream. Ayato asks Julis to tell her why Orphelia is so important to her. As we suspected, Orphelia was a kind, gentle girl who didn’t want to harm even insects and loved to see flowers bloom. She was the one who sewed the handkerchief that Julis carries with her at all times. As we saw in the last episode, ungainly men took Orphelia away. What now learn where they took her: to the location where Julis and Ayato fought her. Back then, it was a research lab called Frauenlob, and it was part of the Integrated Enterprise Foundation. An Arlequint Academy student nick-named Magnum Opus ran the lab, and her goal was to create an artificial Genestella. Their first test subject? Orphelia, who we learn was taken as collateral for the orphanage’s debt. The experiment worked — sort of. While Orphelia is now the most powerful Strega in the world, her power eats away at her being as she uses it. And the reason the reason Julis and Ayato found the building burned down last episode? Orphelia’s power went out of control during the experiments, and her power destroyed not only the building, but the surrounding vegetation. Nothing will grow there now. If Orphelia comes near to living plants, they shrivel, so she can never again get close enough to a flower to watch it bloom. Julis tells Ayato the only thing that will make him stay out of the conflict between the two Strega: that Julis herself and alone has to defeat Orphelia, or the lesson won’t take. After Ayato agrees, Julis says that their priority is Gustave, and that she’ll be counting not only on Ayato, but on the two girls playing possum on his bed. Saya and Kirin sheepishly apologize and say Julis can count on them. Regarding Gustave, Lieseltania has deployed almost all of their police forces all over the country, even at the orphanage so Gustave doesn’t try to use it as leverage. Flora Klemm bursts into the room with terrible news: dragons are attacking the city! The police are pulling all forces from all over to confront the dragons. Julis, realizing that will leave the orphanage unguarded, decides she needs to go on the offensive. Despite her attempt to go alone, Ayato, Saya, and Kirin convince her they’ll help. Julis comes up with a plan. Meanwhile, Yabuki Eishirou gives Claudia incontrovertible evidence that proves who’s behind Gustave and the rest of the plot. Far from being angry, she seems deeply saddened. Ayato engages the Hydra and confirms that it behaves like the mythical beast: it regenerates its heads as he slices them off. He’s doing well attacking and avoiding damage when the heads catch him in a cross-fire. 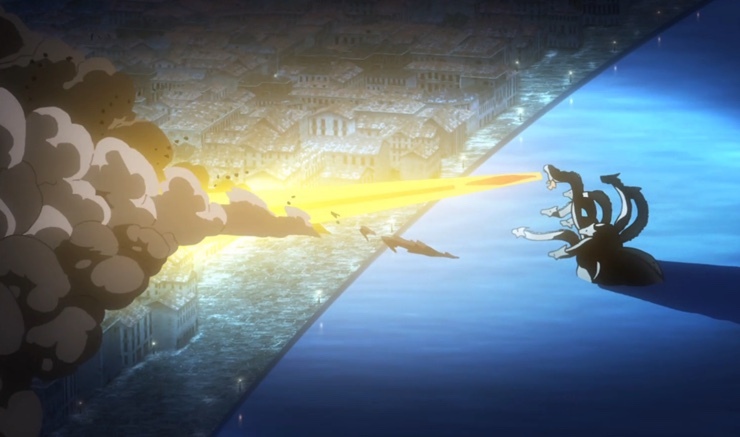 Fortunately, Saya choose that moment to complete her preparations, and from across the lake, she uses a huge sniper rifle to blow off the Hydra’s head nearest Ayato. The two take a moment to coordinate their attack over video phone, then launch a concerted assault. Despite their focus on eliminating heads until only the center one remained, the Hydra kept changing tactics. It forced them to change their approach until they were able to slice off heads as quickly as it could regenerate them. Fortunately, that’s all they needed to do. Ayato and Saya together were nothing more than a diversion for Julis, who constructed a huge trap. She unleashed Rafflesia Duoflores, which encased the Hydra in a cylinder of flame. Ayato lent his and Ser-Veresta’s power to the strike, and the Hydra disintegrated. Saya completed her preparations and was ready to give Ayato sniping support. Capture from the Crunchyroll stream. Watching from a safe distance, Gustave is disappointed and turns to leave. He’s surprised to see Kirin behind him. He’s astonished they could find him, but Kirin explains how he’s too predictable. He expresses his distaste for the lot of them and tries to power up to attack; but Kirin uses her speed to jump behind him and knock him unconscious. Across the lake, Nicolas Enfield, Claudia’s father, watched the battle, also with disappointment. He’s dismayed when Claudia arrives and confronts him. The evidence that Eishirou had gathered proves Nicolas and his company Galaxy (Ginga) had hired Gustave — and Galaxy (Ginga) oversees Seidoukan Academy, Claudia’s school! His motivation? He desperately wants her to change her mind about competing in the Gryps Festa — or at least change her wish. He even drops to his knees to beg. She declines and walks away. The next day, Jolbert thanks them for helping restore peace to Lieseltania. Julis takes the opportunity to reiterate her intention to win the Gryps Festa. Now, though, after recent events, she says she’s going to use the fame and resources she’ll gather to increase the power of Lieseltania’s king — in other words, Jolbert. She wants to reinforce the kingdom’s existing institutions instead of increasing her own individual power. Julis point blank asks Jolbert if he’ll help her, despite all the trouble that it’ll bring. He didn’t even argue. He agreed. While Julis and Jolbert were talking, Madiath Mesa calls Ayato to say he’s found Amagiri Haruka, Ayato’s sister — the sister he was searching for at the beginning of the series. Ayato immediately flies to the hospital in Asterisk’s central district, where Madiath meets him. Telling Ayato that she had been brought in 5 years ago, the doctors are at a loss to explain why her state doesn’t change. Ayato recognizes the effect as his sister’s own Imprisonment Power. She apparently cast the spell on herself, though Ayato has no idea why. She’s in no danger, but she’s in stasis. Hilda Jane Rowlands, a.k.a. Magnum Opus, has a flexible neck and really annoying laugh. She also says she can save Ayato’s sister. Capture from the Crunchyroll stream. As Ayato sits in the garden trying to collect his thoughts, Magnum Opus herself, Hilda Jane Rowlands, walks up to him and says she could save his sister. The scene shifts back to Seidoukan Academy, where Claudia apologizes to all four of her friends for her father’s actions. Kirin asks why he acted as he did. Couldn’t he have found a better way? Claudia theorizes that Nicolas wanted to make a move before Galaxy (Ginga) decided to make an official move. Even Claudia seemed apprehensive about what would happen to her if Ginga took drastic action against her. Julis, already well-versed in politics, asks the obvious question: does Claudia realize that making an enemy of Ginga is the same thing as making an enemy of Seidoukan Academy? Claudia says yes, and in spite of that, she’s unwilling to change her wish. Now that the stakes are fully out in the open, Claudia asks them if they’re still willing to compete on her team. Ayato, distracted by his thoughts of his sister and his unwillingness to accept Magnum Opus’ help, takes a moment to answer. Then he confirms that he’ll compete with her. The show ends with shots of them training together. When Ayato sees that both Saya and Kirin were asleep beside him, he’s awkwardly reassured. But when Julis came in, he seemed startled, almost as if he were expecting her to act all tsundere. But she’s gotten so close to all three of them that she seemed just relieved and happy that Ayato was awake. The relationships between all four of them have come a long way! Julis has come a long way in two seasons. She jokes that Saya and Kirin were playing possum as they listened to the story about Orphelia. She wasn’t mad at all; she’s accepted them as close friends who have access to facts close to her heart. When Julis realizes that the tactic of sending dragons into the city forced the police to respond by abandoning the orphanage, Julis is furious. I thought her reaction was spot on, given how much she loves the orphanage and its inhabitants and given the pressure she’s been under. Julis didn’t even bother arguing when Ayato, Saya, and Kirin said there was no way they’d let her face Gustave alone. Though by now, I wish she’d know better than to even make the suggestion! The battle against the Hydra was exciting to watch. Capture from the Crunchyroll stream. What is it with Gustave and mythical beasts? Given his track record against Ayato, Julis, Saya, and Kirin, you’d think he’d change tactics by now! Well, it’s not like he was a level boss or anything; he was a hired gun (albeit a good hired gun). The Hydra battle scene had a lot of really cool little details. As Ayato ran along the roof tops, he jumped from one building to another. At one point, his jump dislodged some roofing tiles, along with the appropriate sound effects. That kind of thing really draws me into a story. The shot of Kirin confronting Gustave was beautiful. The camera pans around them, the lights on the roof perfectly framing the scene. I loved seeing Kirin get her moment. She’s so powerful, yet she still can’t embrace that concept because of the influence of her idiot uncle. In this episode, she seemed to take yet another step forward into her own confidence. She certainly make short work of Gustave! No wonder the Integrated Enterprise Foundation doesn’t want Claudia, Kirin, and the others to compete in the Gryps Festa! Julis’ plan to use her victories to infuse more power into the monarchy seems really wise for someone her age — even a princess! She’s realized that her own victories can only go so far, and she’s willing to invest her winnings back into her country so it can thrive. I thought this was both mature and wise! I know that I’m supposed to dislike Hilda Jane Rowlands because of what she did to Orphelia. I know she’s likely trying to con or scam Ayato. But her laugh was so impossibly bizarre and her body language was so unique that I couldn’t help but be intrigued. After the events of the episode, Claudia gave everyone a chance to back out of the Gryps Festa. Of course, they decided to fight by her side. Capture from the Crunchyroll stream. I thought it was decent of Claudia to give everyone a chance to back out of the Gryps Festa now that it was clear that participating could mean making enemies of Ginga and Seidoukan Academy. If she keeps on this track, she could make a formidable leader whose followers are very, very loyal. I suspect that’s what Ginga and the Integrated Enterprise Foundation are afraid of. An awful lot happened near the end of this episode — Jolbert agreeing to help, news of Haruka’s whereabouts, meeting Magnum Opus, and training for the Gryps Festa, to name a few. It felt like the writers were trying to pack about 5 episodes of material into 10 minutes. I hope that’s an indication that more seasons are ahead. Otherwise, the setup would be for nothing. * Yes. I know it’s too late. But what can ya do? Most of the screen time in this episode went to the battle with the Hydra. And in some ways, battles were among The Asterisk War’s most powerful scenes. The action was fluid, the Hydra attacked realistically, and Ayato’s tactics were effective and believable. 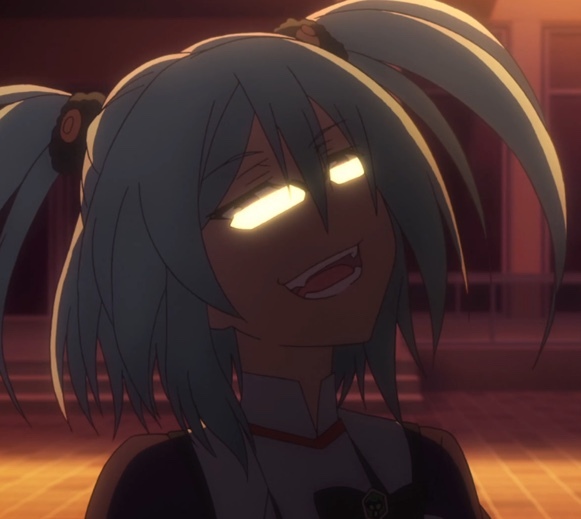 So, I can’t object, except to say Saya should have gotten more screen time! Julis even convinced her previously politically inept brother, the king, to support her. Looks like they’re getting ready to change the world or something! Capture from the Crunchyroll stream. 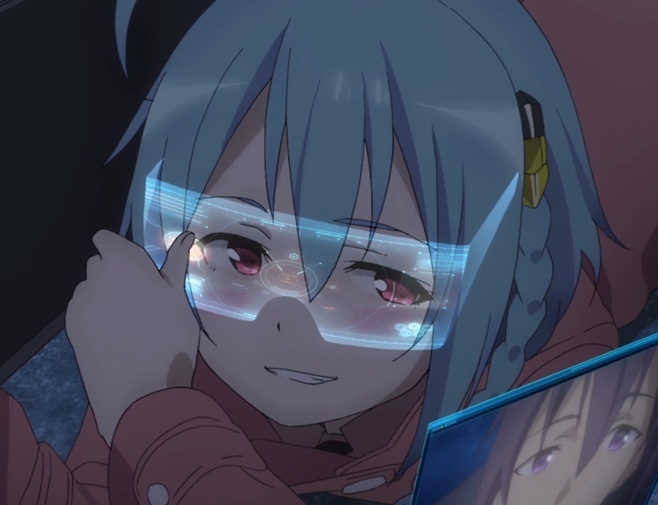 I think The Asterisk War fulfilled its mission, and think first and foremost, the show was about Julis. When we first met Julis, she had some mysterious goal anchored by a handkerchief she treasured. First Ayato earned her trust, then Saya and Kirin. By the end, she had even enlisted the help of her brother, the king of Lieseltania, who had previously shown no interest in politics. She was part of a group poised to shake the foundations of that world. That’s not to downplay Ayato’s importance. After all, the very first scene shows Haruka battling Madiath Mesa and set his plot in motion. We got some closure on that story line. Ayato was reunited with his sister, after a fashion. But she’s in what appears to be a self-inflicted imprisonment, and we don’t know why. Nor do we know how it could be undone. I hate not knowing, so I hope we get another season! I enjoyed watching The Asterisk War, and I enjoyed reviewing its episodes. The battle scenes were interesting (except the for too prevalent “let’s all pause so the hero can figure things out” moments), the world felt realistic, and the politics were engaging. More than any of that, though, I liked the characters and the character moments. From Saya startling Ayato in his dorm room by hanging upside down from the railing around the floor above, or Kirin standing up to her idiot uncle, the little character moments made the show for me. Here’s hoping that we’ll get a third season! Kabaneri of the Iron Fortress Episode 10: Waaaay More Evil Doesn’t Tell the Half of It!